The early years of life can have a lasting impact on long term health. What a child or young person eats, and the habits they make in their earliest years can set the pattern for the rest of their lives. Statistics from the National child Measurement Programme (NCMP) show that 1 in 5 children in North Yorkshire start school overweight or obese and almost 1 in 3 children in North Yorkshire leave primary school overweight or obese, therefore there is much that can be done by Early Years settings/practitioners and schools in order to reduce these statistics. 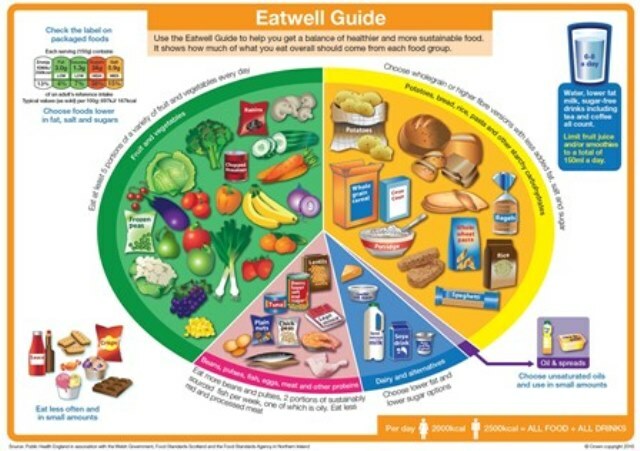 Public Health England encourages organisations and individuals to use the Eatwell Guide to make sure everyone receives consistent messages about the balance of foods in a healthy diet. The Eatwell Guide defines the government’s advice on a healthy balanced diet and is a visual representation of how different foods and drinks can contribute towards a healthy balanced diet. Based on the 5 food groups the Eatwell Guide shows how much of what you eat should come from each food group. N.B. These guidelines are not applicable to children under 2 years of age. Consuming too much sugar in the diet can impact on a child or young person’s weight, dental health and likelihood of long terms conditions in adulthood such as type 2 diabetes. Avoiding sugary drinks and replacing these with water or milk for children aged 0-5 years is recommended. Eating a nutritionally balanced diet is not only important for a child or young person’s weight but can also impact on wider things including their digestive health and ability to learn. The National Child Measurement Programme (NCMP) measures the height and weight of children in reception class (aged 4 to 5 years) and year 6 (aged 10 to 11 years) to assess overweight and obesity levels in children within primary schools. This data is used at a national level to support local public health initiatives and inform the local planning and delivery of services for children. Children's heights and weights are measured and used to calculate a Body Mass Index (BMI) centile. The measurement process is overseen by trained healthcare professionals in schools and is managed and delivered by the 5-19 Healthy Child Service in North Yorkshire. Schools value the link between pupil health and wellbeing and attainment and many schools are taking proactive steps to promote whole school action through the curriculum, school leadership practices, school ethos and environment, participating in the healthy schools programmes, and through partnerships with parents and the wider community. facilitating and encouraging physical play during break times. The national Change4Life campaigns aim to help families make healthier choices and get active. Information and resources can be found by visiting the Change4Life website. Schools can give their pupils a head start by encouraging healthy habits during their first year at school, when they'll be weighed and measured. Primary schools across the county that are signed up to the School Fruit and Veg Scheme periodically receive Key Stage 1 and 2 resources which include lesson plans, assembly presentations and suggestions for how to get the whole school involved. Visit Change4Life School Zone for more curriculum-linked resources and inspiration to support teaching children about healthy eating and being active. The 5-19 Healthy Child Service works across the county in schools, youth venues and in the family home. The service is the first point of contact for schools that have concerns about the wellbeing of their pupils. The service will offer advice and information to parents and work directly with children and young people to tackle their health issues, including weight issues. The 5-19 Healthy Child Service can also make referrals to the Healthy Choices Service , which offers specialist one to one support to children and families. The service will provide practical information, advice and support to children, young people and their families to reduce Body Max Index, increase physical activity, reduce sedentary behaviour and improve eating behaviours. If you would like more information about how your school can further support healthy weight among your pupil population please contact the Healthy Child Service on: 01609 780780. Healthy Weight Pathway for Children, Young People and Families in North Yorkshire - A resource to support professionals in navigating the children and families obesity offer in North Yorkshire.